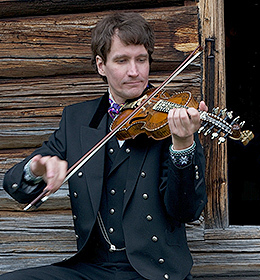 Today, the Hardanger violin is regarded as Norway's national instrument. The name comes from the fact that the first known instruments were made in the Hardanger area. 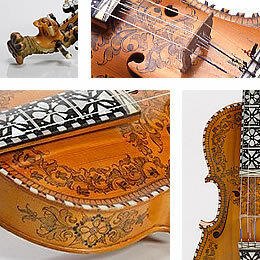 The modern Hardanger violin is a little smaller than the ordinary violin, richly decorated with pen drawings and mother-of-pearl inlays, and usually has 4 or 5 resonating understrings. Except for the element of understrings, where the Hardanger violin has relatives in both the near and far East and in Europe, the Hardanger vioin is today an exclusively Norwegian phenomenon. The oldest Hardanger violin that has been found and registered is dated 1651(the Jastad violin). E,Grieg composed many famous music based on the melancholic tone of this instrument. Rio Yamase is a highly skilled and experienced performer of the Hardanger violin. Through many years, she has acquired her knowledge about the Hardanger violin and Norwegian folk music from the best Hardanger violin players in Norway. The efforts of Rio, with her music, has played an important role for Norwegian culture and music in Japan. It has been my pleasure to cooperate with Rio for many years through her liaison with Hardanger. Rio Yamase is very careful to learn the Hardanger fiddle tunes accurately. She is very concerned that the music will be performed in the original style and have the correct melody, rhythm, tonality and appropriate ornaments. She is also very interested in and knowledgeable about the historical aspects of the Norwegian Hardanger fiddle tradition, and so on through the study of, among others, Ole Bull, Johan Halvorsen and Edvard Grieg. She has for many years taught by some of the best fiddlers in Norway. The tunes she learned from me, she performs in a great way and is thus part of the old Norwegian Hardanger fiddler tradition by, among others, Knut Dahle, Ola Mosafinn, Myllarguten and Lars Fykerud. I can warmly recommend her as a musician and fiddle instructor. Rio Yamase(Violin & Hardingfele, composition & arrangement) Born in Kuala Lumpur, Malaysia. Graduated on violin with top marks and distinction from Toho Gakuen University in Tokyo as a student of the late Professor Toshiya Etoh. Studied Hardanger violin under the late Hallvard Kvaale. From 1992 started performing with orchestra inside and outside of Japan, and had her own concert in Oslo Munch museum and other places in Japan and Scandinavia. Introduced on major television broadcasts such as NHK and in the culture sections of major newspapers such as the Asahi Shimbun column Tenseijingo, the Nikkei Shimbun and the FujiSankei Business I, and also in Scandinavian Medias. Composed and performed music for a Japanese animated short film “Monmon the Water Spider”, produced by Studio Ghibli and its director Hayao Miyazaki. In addition, she went on playing the Hardanger fiddle on a Ghibli animation movie “Tales from Earthsea”. She has released CDs “Golden Aurora” (2004), “Crystal Rose Garden” (2005), and "Love Song from the Fjords" (2015) from Victor Entertainment (Inc.), and other CDs. In 2014, which is her 10th anniversary year of major debut, she started concert activities in Malaysia, which is her birthplace. She has performed in variety of concerts and events held by Malaysian company, YAMAHA Malaysia, Norwegian embassy in Malaysia, and Japanese embassy in Malaysia. The concerts were posted on medias such as one of the largest English Newspapers “Star” and “Guang Ming”. This year on 15th June, which is birthday of the great Norwegian composer Edvard Grieg, she was appointed as the Good-will ambassador of Hardanger by the Hardanger Council. Rio Yamase graduated on violin with top marks and distinction from Toho Gakuen University in Tokyo as a student of the renowned teachers the late Professor Toshiya Etoh and Mrs. Angela Etoh. She also studied Hardanger violin under Knut Hamre, Christian Borlaug, and the late Hallvard Kvaale, who are famous fiddle players in Norway. Pursuant to her formal studies, Ms. Yamase performed as a solo violinist with the Kansai Philharmonic Orchestra and the Slovak Philharmonic Chamber Orchestra in 1992. In 1998 she kicked off her Japan-Scandinavia tour with a remarkable concert at the Munch museum in Oslo. From 2003 she started to incorporate the Hardanger violin into her performances. She was introduced as “The pioneering Hardanger fiddler of Japan” on major television broadcasts such as NHK’s Good Morning from Studio Park and Ittorokken, and in the culture sections of major newspapers such as the Asahi Shimbun column Tenseijingo, the Nikkei Shimbun and the FujiSankei Business i. She has also been invited to hold concerts and lectures introducing Nordic music in various parts of Japan and Scandinavia including places like the Suntory Hall; the respective embassies of the Scandinavian countries; events with the Scandinavian Tourist Board (STB) and Scandinavian Airlines (SAS); participating in special charity cruise events on the Asuka and the Pacific Venus; and performing on the trip with the Norwegian Coastal Express (Hurtigruten) - often described as the “World’s Most Beautiful Sea Voyage” - not to mention but a few. Her violin and Hardanger fiddle playing has been featured in both radio and TV on the Norwegian National Broadcast (NRK), and also as top entertainment news in the leading Norwegian newspaper Aftenposten. With her feet firmly planted in the Classical tradition she explores the boundaries of Folk, Pop, Celtic and Americana, and has released the 2 CDs Golden Aurora (2004) and Crystal Rose Garden (2005) on Victor Entertainment (Inc.), which also includes some of her original compositions. Furthermore, at the Cremona Violin Exhibition Party sponsored by the Italian embassy and YAMAHA Music Trading Corporation, Mrs.Yamase performed on the Stradivarius violin called “Il Cremonese”; the great national treasure of Italy with an estimated value of 500 million dollars. This got a lot of media coverage, both in Italy and Japan. In 2006 she both composed and performed the music for the Japanese animated short film “Monmon the Water Spider”, produced by the renowned anime studio Studio Ghibli and its famous director Hayao Miyazaki. In addition to the release of the short film soundtrack, she even went on playing the Hardanger fiddle on the full-length Ghibli animation movie Tales from Earthsea released that same year. In 2007 Ms. Yamase played the Hardanger fiddle at the first staging ever been made in Japan of the full verison of Ibsen’s theatrical play Peer Gynt. This was performed at The Tokyo University of the Arts in cooperation with Tokyo New City Orchestra, and was very well received. In October the same year she summoned the Norwegian musicians with whom she had performed with at the Munch museum some years earlier, and went on the successful Japan-tour - A Gift from Scandinavia - in Hyogo, Niigata and Tokyo. 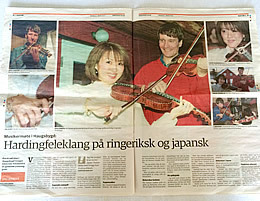 In 2008 she continued with her lectures at the Asahi- and NHK Cultural Center, and at a　forum held by Tokyo Shimbun called “Rio Yamase and Norway: Scandinavia - the place where they play the Hardanger fiddle”, she presented different cultural exchange activities which all had developed out of love for music. In 2009 the first Japan- Hardanger Cultural Exchange Festival was held in Ullensvang, and the mayor in the district of Hardanger held the opening speech. The big regional paper Bergens Tidene and other local media covered the event. In December that same year the Japan Hardanger Club was founded; a corporation with the purpose of introducing Nordic culture in Japan and to promote cultural exchange. Ms. Yamase assumed the position as president of the company. In March 2010 she performed together with the Bergen Youth Orchestra, and 2 month later she was selected to perform at the Hardanger Music Festival as one out of only two international acts. The same year, with the blessing and cooperation of the local government of Hardanger and Scandinavia Airlines (SAS), she started the Rio Yamase Norway Hardanger Violin Scholarship, which, on a yearly basis, sends 2 students to Hardanger on a short-term exchange program. This has created a lot of attention within the local community. In 2011 Mrs. Yamase has, together with continuous concert activities, started the lecture series “Music as a tool of Cultural Exchange” at Saga University Department of Economics. She arranged the Japan- Hardanger Cultural Exchange Festival for the second time in June 2012. This year she is also featured on the first page of the National Music Textbook for Elementary School (1st to 3rd grade) in the “Foundation studies – and materials for enjoying music” section. Under the heading “Folk music instruments of the world”, an in-depth introduction of the Hardanger violin and Mrs.Yamase as a performer is being presented. Upcoming projects for her in 2013 include Hardanger violin performance on the main theme to the film Aoki ga Hara, for which Tokyo governor Shintaro Ishihara, who also is executive director, has written the original manuscript. 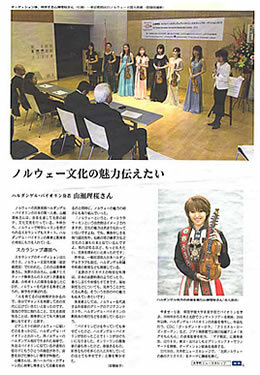 In April, the second “Rio Yamase Hardanger Violin Scholarship” was held, and two of her students studied in Hardanger. In October, “Gala concert” of the two students was performed in the Norwegian embassy in Tokyo, and all seven mayors of Hardanger were invited. 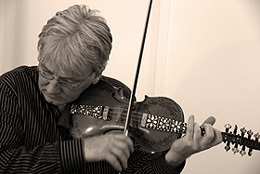 In the same time, Knut Hamre, who is a great master of Hardanger violin was invited to Japan, and had concerts in Tokyo and Osaka together with Rio Yamase. In 2014, which is the 10th anniversary from her major debut, she performed on the Asuka II northern Europe cruise (Sweden, Norway, and Iceland) as a guest artist. She also started concert activity in Malaysia which is her birthplace. In March 2015, she held a 10th anniversary concert in the Royal Norwegian Embassy in Tokyo. On 22nd April, which is the beginning of her 11th year, her 10th anniversary CD "Love Song from the Fjords" will be released. At the present time she continues a wide range of musical activities and lectures, including actively seeking new ways of introducing the Hardanger violin and teaching the next generation of students in Japan. 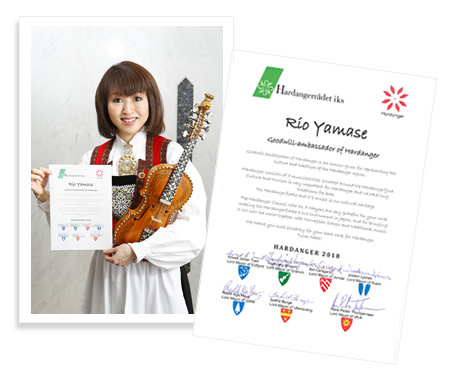 On behalf of the citizens and local communities in Hardanger, it is with great pleasure and honour we announce that Ms Rio Yamase has been appointed a Goodwill-ambassador of Hardanger. We, the mayors of the municipalities of the Hardangerfjord region, have on several occasions had the pleasure to see the results of Ms Rio Yamase’s enduring work since many years, and to see a century old local tradition being promoted and taken to a professional level by Ms Rio Yamase. This is an important contribution to cultural awareness both in Japan, Norway and in Hardanger. We appreciate all the efforts and hard work of Ms Rio Yamase, with our best wishes for the years to come. First of all, congratulations to Ms Rio Yamase with the appointment as a Goodwill-ambassador of Hardanger. As a representative of the tourism industry in the Hardangerfjord region it is with great joy and pleasure we have followed the work of Ms Rio Yamase since many years. Culture has been an important part of tourism in our region since the early days in the 19th century when tourists started to come from England and Germany. Our guests at that time came primarily because of the wild and beautiful nature, but of course they also met with the local people, their music, traditions and daily life. Not only tourists came, our great composer Edvard Grieg spent long periods in Hardanger, also learning about the traditional music in the area, and was inspired to transform these ancient Norwegian traditions into art music. And from exactly the same sources, this is now what Ms Rio Yamase has made her passionate mission to promote in Japan and in other countries so exquisitely. 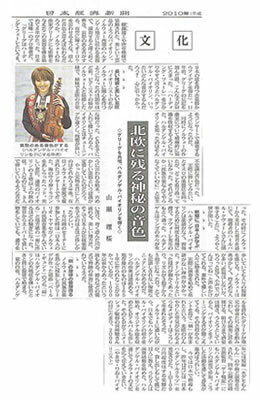 We are so happy for Ms Rio Yamase’s continuous efforts, resulting in the proliferation of the knowledge of both classical music and the folk music of Norway and Hardanger to new audiences. We are proud to be a part of the heritage that Ms Rio Yamase is promoting so well in Japan and wishing her further success in the years to come for the continuing work both in Japan and abroad. Rio Yamase ble uteksaminert på fiolin med toppkarakter og utmerkelse fra Toho Gakuen University i Tokyo under veiledning fra de beromte lærerne Professor Toshiya Etoh og Angela Etoh. Hun har også studert Hardingfele under Knut Hamre, Christian Borlaug, og den avdøde Hallvard Kvåle, som er berømt felespiller i Norge. Etter å ha fullført de formelle studiene jobbet hun som solo fiolinist ved Kansai Filharmoniske Orkester og Slovakiske Philharmonic Chamber Orchestra i 1992. I 1998 startet hun en lengre Japan-Skandinavia turné med en bemerkelsesverdig konsert på Munch-museet i Oslo. Fra 2003 begynte hun å ta i bruk Hardanger fiolinen under sine opptredener. Hun ble tidlig introdusert som “Japansk pioner på hardingfele” i media, bla. på NHK sitt program Good Morning from Studio Park og Ittorokken og i kultur seksjonen i store aviser som Asahi Shimbun, Nikkei Shimbun og FujiSankei Business i.
Hun har også blitt invitert til å holde konserter og foredrag om nordisk musikk i ulike deler av Japan og Skandinavia, inkludert steder som Suntory Hall; de respektive ambassadene i de skandinaviske landene; arrangementer for Scandinavian Tourist Board (STB) og Scandinavian Airlines (SAS); deltatt på veldedighets cruise på Asuka og Pacific Venus; og på turer med Hurtigruten - ofte beskrevet som “verdens vakreste sjøreise” - for å nevne noe. På fiolin og hardingfele har hun også vært omtalt både i radio og TV på den Norske Rikskringkasting (NRK), og i den ledende norske avisen Aftenpostens underholdnings nyheter. Med føttene godt plantet i den klassiske tradisjonen utforsker hun grensene mellom Folk, Pop, Celtic og Americana, og har utgitt de 2 albumene Golden Aurora (2004) og Crystal Rose Garden (2005) på Victor Entertainment. De inneholder også flere av hennes originale komposisjoner. På Contemporary Cremona Violin Exhibition, som ble sponset av den italienske ambassaden og YAMAHA Music Trading Corporation, opptrådte Mrs.Yamase på Stradivarius fiolinen “Il Cremonese”; den store nasjonalskatten i Italia med en estimert verdi på 500 millioner dollar. Dette fikk mye medieomtale både i Italia og Japan. I 2006 både komponerte hun og fremført musikken til den japanske animerte kortfilmen Monmon the Water Spider, produsert av det anerkjente animasjonsstudioet Studio Ghibli og deres verdensberømte regissør Hayao Miyazaki. Samme året, i tillegg til å gi ut lydsporet til denne kortfilmen, spilte hun også hardingfele på Ghibli’s helaftens animasjonsfilm Tales from Earthsea. I 2007 spilte hun hardingfele på uroppføringen av Ibsens Per Gynt i Japan. Den ble satt opp på Tokyo University of the Arts i samarbeid med Tokyo New City Orchestra og ble svært godt mottatt. I oktober samme år inviterte hun de norske musikerne som hadde bidratt på Munch museet konserten noen år tidligere til en vellykket Japan-turné. Under tittelen “En gave fra Skandinavia” hadde de konserter i Hyogo, Niigata og Tokyo. I 2008 fortsatte hun med sine forelesninger ved Asahi- og NHKs Kultursenter, og på et forum presentert holdt av Tokyo Shimbun med temaet “Rio Yamase og Norge: Skandinavia - stedet hvor de spiller hardingfele” presenterte hun ulike måter å drive kulturutveksling på - alle med utgangspunkt i kjærligheten til musikk. I 2009 ble den første Japan-Hardanger Kulturutvekslingsfestival avholdt, og åpningstalen ble holdt av ordføreren i Hardanger kommune. Den største regionale avisen Bergens Tidene og andre lokale medier dekket arrangementet. I desember samme år ble den Japanske Hardanger Klubb stiftet; et selskap med det formål å introdusere nordisk kultur i Japan, og for å fremme kulturutveksling mellom landene. Hun tiltrådte samtidig stillingen som president i selskapet. I mars 2010 opptrådte hun sammen med Bergen Ungdomsorkester, og 2 måneder senere ble hun valgt til å opptre på Hardanger Musikkfest som en av bare to internasjonale artister. Samme år, med velsignelse og samarbeid med de lokale myndighetene i Hardanger og Skandinavia Airlines (SAS), startet hun Rio Yamase’s Norske Hardangerfiolin Stipend, som på hvert år skal sende 2 studenter til Hardanger på et 2 ukers utvekslingsprogram. Dette har fått mye oppmerksomhet i lokalsamfunnet. I tillegg til kontinuerlig konsertvirksomhet startet hun i 2011 foredragsserien “Musikk som redskap for kulturutveksling” ved Saga Universitet Institutt for Samfunnsøkonomi. Hun arrangerte Japan-Hardanger Kulturutvekslingsfestival for andre gang i juni 2012. Samme år, ble hun omtalt på første side i Musikklærebok for Barnetrinnet (første til tredje klasse) i heftet “Grunnleggende musikk studier - Hvordan nyte musikk”. Under overskriften “Verdens Folkemusikkinstrumenter” blir det her gitt en grundig innføring i instrumentet Hardanger fiolin og Rio Yamase som hardingfeleutøver. Kommende prosjekter i 2013 inkluderer fremførelse av hovedtemaet til filmen Aoki ga Hara på hardingfele. Dette er en film hvor Tokyo guvernøren Shintaro Ishihara, i tillegg til å være utøvende produsent, har skrevet det originale manuskriptet. I 2014, som er hennes 10 års jubileum, hun hadde konserter på Asuka II nord Europa båttur (Sverige, Norge, og Island) som en gjest artist. Hun begynte også å ha konserter i Malaysia, fødestedet hennes. I Mars 2015, hadde hun 10 års jubileum konsert på den norke ambasaden i Tokyo. På 22 April, som er den første dagen på hennes ellevte år, blir hennes 10 års jubileum CD "Love Song from the Fjords" ut. I år 15. juni, som er fødselsdagen til den store norske komponisten Edvard Grieg, ble hun utnevnt til velvilje Hardanger-ambassadøren ved Hardangerrådet.